Want to know more about ELL, the new leasing company? This is their website. In March 2014, European Locomotive Leasing (ELL), a new provider of full‐service locomotive leasing solutions to freight and passenger operators throughout continental Europe, signed a framework contract with Siemens for the delivery of as many as 50 Vectron locomotives. The order is for AC locomotives and for multi-system locomotives. The AC units are intended for border-crossing traffic in Austria, Germany and Hungary. The multi-system units can be deployed in border-crossing traffic not only in Austria, Germany and Hungary, but also in Poland, the Czech Republic and the Slovak Republic. In addition to the national train control systems, each locomotive is equipped with ETCS. The locomotive comes with a maximum output rating of 6400 kW and is built for a top speed of 160 km/h. It is already wired to accommodate other train control systems. After initially being hired to different operators (MMV, LTE), the three DE/AT/HU/PL/CZ/SK/RO/NL configured Vectron locomotives for ELL were last seen together in Mönchengladbach. This afternoon, a Westbahn KISS double decker EMU crashed onto a CargoServ freight train during a test run. Reportedly, five people are injured. Read more here. Herbert Pschill took pictures of the four new white Vectron MS locomotives recently outshopped by Siemens, that have now arrived at Hegyeshalom [HU]. First rumors tell us that ELL 193 289-293 are the first units soon to be used for pulling the EC Prague - Berlin - hamburg EC trains. Today a white Vectron locomotive left Munich, and was taken to Passau. The image shows stock locomotive 22250, that has recently received its final designation: 91 80 6193 289-6. The multi system electric for central Europe will be delivered to lease company ELL. ELL locomotive 193 215, currently operated by LTE, has been seen in Romania. As far as we know, it is the first time a Vectron locomotive is used in this country to pull a revenue earning freight train, since Siemens locomotive 193 822 was in the country for tests (Early 2015). Pictures are coming in of ELL Vectron locomotive 193 270 pulling passenger trains of České dráhy in the Czech Republic. First sources state that training of ČD train drivers has started. The operator will start international EC services on Prague - Berlin - Hamburg. This year, ČD will hire eight Vectron MS locomotives from ELL, two more will come later. European Locomotive Leasing (ELL), a provider of full-service leasing of electric locomotives, has ordered an additional eight Vectron locomotives from Siemens. ELL is currently the biggest Vectron customer. The multisystem locomotives have a maximum output of 6.4 MW and a top speed of 200 km/h. ELL will lease the locomotives to the Czech railway České Dráhy for passenger service on the Prague-Berlin route. With this order, Siemens has passed the mark of 500 sold electric locomotives – and the counter now stands at 507 in total. “This milestone highlights the success story and reliable service of our Vectron locomotives throughout Europe. We’ve already convinced 31 customers in 14 countries with our flexible platform and customer-tailored equipment packages,” said Jochen Eickholt, CEO of Siemens Mobility Division. The locomotives are currently certified for operation in Austria, Bulgaria, Croatia, the Czech Republic, Finland, Germany, Hungary, Italy, Norway, Poland, Romania, Serbia, Slovakia, Slovenia, Sweden, Switzerland and Turkey. This is the third order Siemens has received from ELL. In total the lease company now has 108 units on order (50+50+8). We have registered 78 until now (201-230, 233-277, 279, 831, 832) that have been delivered. ELL has some more locomotives on hire from Siemens. This morning we already posted about České Dráhy performing the first driver training tests with ELL locomotive 193 270. Manuel Stritzinger caught ELL locomotive 193 267 on 24.04.2017. New is that the locomotive now sports the logos (and yellow color) if its operator: CargoServ. In September 2016, ELL 193 271 was damaged as it derailed in Hungary. One month later it was sent to Munich for repair. Since 08.01.2017, the DE/AT/HU/CZ/SK/PL/RO/HR/SI (!) machine is back in service. The Salzburger Lokalbahn (SLB) is now operating the machine, as SLB's own 1216 940 / 91 was sent to Linz for maintenance and preparation for ETCS installation. New for ELL and TX Logistik: 193 277. Seen by Timo Albert on 15.12.2016 in Wanne-Eickel. Sebastian Carugati and Maurizio Lisdero were able to catch the new 193 259 of ELL with the logos of SBB Cargo International on 11.11.2016. The machine was seen in Balerna and Lugano. This is the all new 193 259 for ELL, a multi system locomotive with a country specific package for DE/AT/CH/IT/NL, just like ELL 193 256. The approval for Italy and the Netherlands is still pending. New is that the 259 sports the logos of SBB Cargo International. The livery on these machines is slightly different from the ELL standard. The sides are painted in dark blue, in stead of white. And up front the machine, of course, has the two red stripes to comply with Italian safety regulations. Check this beautiful video of the EMC test runs with ELL Vectron 193 252 and Hector Rail TRAXX locomotives, as performed last September. Thank you Peter Frost. Today we received new images of both ELL Vectron locomotives that are operated by PPD Transport from Croatia. All images were taken in Zagreb by Martin Šarman and Mario Beljo. It gives us the opportunity to compare the slightly different stickers on the locomotives. The 268 has a white 'leaf' around 'Enno', where the one on the 273 is bright green. In general, the stickers on the 273 seem to be a little brighter. ELL 193 271 is on its way back to Munich. It arrived in Passau (DE) today. The machine was in Budapest where mud and stones had to be removed from under its frame. The machine was damaged when it derailed in Budapest-Soroksár on 17.09.2016. During the past week it was made 'ready to roll', so it could be transported back to the Siemens factory in Munich, where it will be repaired. Christian Blumenstein made a picture of 193 271 today, behind ELL 193 270, in a LTE freight train (no 41156). Also 193 272 was taken along, resulting in an image with three ELL Vectrons leading this freight train. Picture by Jürgen Steinhoff taken on 13.10.2016 in Uelzen. The first images are being published of ELL 193 256 in Austria. The Vectron multi system locomotive, which livery is not yet fully completed, has the country specific packages for Germany, Austria, Switzerland, Italy and the Netherlands. At this moment it is only approved for Austria, according to its UIC grid. An (image) report of the accident can be found here. Brand new ELL Vectron no. 193 271 has derailed in Budapest-Soroksár. According to the report the locomotive was in Ferencvaros and ran away unmanned. The braking systems could not stop the locomotive and prevent a derailment. ELL > SETG 193 218 has a remarkable new livery. Striking is the gold metallic foil. The theme of the livery is 'Europe' featuring Ludwig van Beethoven, who wrote the European hymne 'Ode an die Freude'. With this livery SETG also celebrates its 15th anniversary. Passenger train operator Snälltåget from Sweden will soon receive three ELL locomotives: 193 253, 254 and 255. These machines are red and carry the text 'Loket Loket Loket' (Loket = locomotive). Snälltåget has ten new drivers and wants to start first services with the Vectrons in October. At this moment Hector Rail is providing Snälltåget with tractive power and loco drivers. Snälltåget is known for its (night) trains connecting Malmö with Stockholm and Berlin. This is ELL 193 271. It is the second locomotive in the fleet of the lease company that has the country specific packages for DE/AT/HU/CZ/SK/PL/RO/HR/SI. First one is the 193 268. Thank you Michael. 193 268 is now used for hauling direct freight trains from Slovenia to Hungary. In the meanwhile, PPD bought two class 2044 diesel locomotives from the Croatian railways (HZ PP). Both are being refreshed by TZV Gredelj. A PPD livery has already been applied. Toma Bacic. Brand new 193 268 is a special one. The multi system locomotive has a impressive country specific package. Take a seat: DE/AT/HU/CZ/SK/PL/RO + RS/HR/BG/TR. Where the locomotive will be used in practice, we will have to await. Fact is that the machine carries vinyls of PPD Transport from Zagreb, Croatia. This sounds new, but is actually very familiar. Is the current name of Adria Transport, that joined the PPD Group in 2015. So, a new locomotive, in a new configuration, for a new customer to lease company ELL. Countries in the south-east of Europe, such as Croatia, Serbia, Bulgaria and Greece, are currently in the focus of many European freight operators. The markets were liberalized, are opening up, new operators being founded. This is being translated into operators and lease companies preparing their rolling stock for services in these regions. We have seen Vectrons, Trans Montanas and ES64U4 locomotives being homologated in Croatia for example. Just today we got the news that Kombinovani Prevoz is the first independent railway operator to launch freight services since the Serbian railway market. Interesting! Thank you Ludwig GS for the picture. A third ELL locomotive, sporting the logos of TX Logistik, has been put into service lately. The image shows the brand new 193 266 which now has the same livery as 193 252 and 265. By the way, 193 266 is pulling a Velaro high speed train for the Turkish railways TCDD, which are being produced by Siemens in Krefeld in Germany. Our thanks goes out to Oliver Scholz for the picture. ELL locomotive 193 206 is on its way back to the Czech Republic and Slovakia, after having received a service by Siemens in Munich. However, a piece of the yellow RegioJet foil is missing, showing again the locomotive's true identiy ;) - Thanks Christian Tscharre. Published today: Siemens and Leasing company ELL from Austria have closed a 2nd deal for another 50 Vectron locomotives (In 2013 Siemens and ELL already closed a first deal for 50 units). Delivery of new machines is therefore continued. Over 50 units are already in service at this moment, with more being ready to go (193 264-267 for example). We all know about the big train crash in Bad Aibling last February. Very sad. Lives were lost, many speculations about the possible cause, a lot of discussions about railway safety. Several trains were destroyed, resulting in a shortage of rolling stock for rail operator Meridian. Since this week, a rake of National Express colored coaches is used as 'replacement train'. The train is hauled by locomotives hired to Lokomotion, resulting in exotic train combinations in southern Germany. We have seen 185 661 in Lokomotion livery and 193 208 in ELL livery for example. Thank you Michael Raucheisen. Compare this livery to the creme/blue livery that WLB/WLC once had..
TX Logistic normally brands its locomotive only with its logos. Sometimes an additional slogan is added. But this is the new 193 252, hired from ELL. This machine has some more operator specific decoration. On 03.03.2016 the machine was send on its way to Linz in Austria. (Michael Raucheisen). Lately we are involved in a discussion about the dark blue of the ELL livery, applied on Vectron locomotives. Some machines seem to have a very dark, anthracite colored base color, were others appear to be more blueish. At first we thought, it has to do with the weather, the light, the sun, the camera, etc etc... but no. The image above shows that the locomotive on the left, the 224, is more greyish than the 202 on the right, which is newer (despite its lower number). 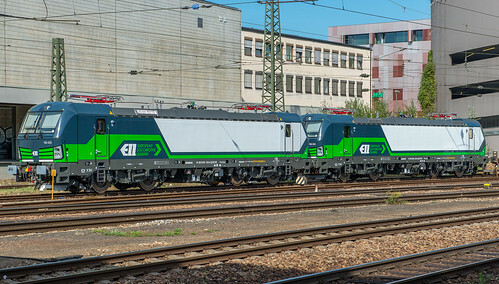 [Update] With the help of our fans we have found a possible explanation for the fact that ELL Vectron locomotives are being delivered in different colors: paint vs. stickers. The locomotives with a more blueish color have a painted ELL livery, were the machines with a anthracite base color have stickers over a white paint coat. When you look very closely, one can still see some white paint around the screws and thin white lines around the air intakes up front. If a locomotive is stickered or painted sure has something to do with Siemens' off-the-shelf production method (building all machines in a basic configuration including a white base paint) in combination with how fast ELL wants to have its locomotives for a certain contract/customer. Wir haben Grund zum Feiern: ELL hat die 50. Vectron bestellt! So it is announced by Siemens from Austria. Lease company ELL from Austria has already 43 Vectron locomotives in service. For an overview, check the ELL page. RegioJet is going to withdraw its Košice - Bratislava passenger services. It plans to do this during the first quarter of 2016. The night service will stop per 13.12.2015 already, the three day services will continue until after Christmas. RegioJet set up its Slovakian services with ELL Vectron locomotives only one year ago. It states it has to withdraw already because it can not compete with ZSSK any longer. RegioJet is accusing the Slovakian state railways of applying ticket prices that can not cover the costs. RegioJet, ZSSK and the Slovakian government are in constant dispute. Yep, it is time for another new Vectron for ELL, no. 242. It had its maiden run today and was portrayed by Helmuth von Lier in Augsburg. Since 16.10.2015, Westbahn from Austria is running additional trains services from Vienna to Linz vv. These 'Formul 5' trains run on Friday - Sunday. Westbahn uses coaches hired from Bahntouristik Express (4x Bvcmz / 2 in blue/red and 2 in red/light gray (ex DB Autozug)). [Edit] The trains are hauled by a locomotive of WLC. During the past weeks this has been Siemens > ELL 193 822. WLC used the locomotive during the other weekdays for its freight trains. However, on 31.10.2015, ELL > WLC 193 238 replaced the 822, see image below. The first Vectron in service of Austria-Hungarian operator GySEV is ELL 193 235. It replaces an OBB 1116 series locomotive. We made a mistake: This image shows two new Vectron locomotives for ELL: 193 233 and 234 (not 232/233). Both will be hired to WLC soon. On 23.07.2015, SRT 487 001 took ELL 193 209 from Arth-Goldau to Lausanne. At that moment, Siemens had completed test runs with the 209 on the Südostbahn, with its 50 promille gradients. This week tests were done around Lausanne during the night. Thanks to Ákos Károly we have a first shot of ELL > MMV 193 228 in revenue service. Picture made in Pilis. Yesterday, Siemens released the new ELL locomotives 193 201 and 230. Both got a restyle before they were sent of to Linz (Austria) for final customer specific adjustments. 193 201 got its big white ELL surface removed and got SB Cargo International logos. 193 230 got the logos of RTB Cargo. Also seen in Munich, Siemens 21975 - ELL 193 202, awaiting its maiden run. With this machine, the number series 193 201-230 is complete. Curious: ELL acquired 193 820 from Siemens after testing period, but it is not clear if this machine is part of the framework agreement though. According to Siemens 183 821 is not sold to ELL. But it does have an ELL Übergabebuch. Siemens has been performing trials with ELL 193 209 to Schwarzenburg [CH]. Particular about this route is the steep 35 °/oo gradient and small curves with only 250 meter radii. Siemens is evaluating the forces between wheels and tracks. Two Golden Pass coaches were taken along to have sufficient braking power, as the locomotive misses pneumatic brakes on two wheels, which are special 'Messradsätze'. On 13.06.2015, Siemens 193 901 left Munich together with ELL 193 209. Together they ran to Basel, Switzerland. The 193 209, with SBB Cargo International logos, has measuring equipment on one of its axles, including a 'Messradsatz'. Update: We have added an image of 193 209 in Basel. On 13.06.2015, ELL Vectron locomotives 193 226, 227 and 229 left Munich. They ran to Linz in Austria. New is that 193 229 now sports the logos of RTB Cargo. 2015-06-14 [DE] Vectron with 'last mile steam engine'? [DE] Vectron with 'last mile steam engine'? Next! Siemens has completed the maiden runs of another three ELL locomotives: 193 226, 227 (both multi system) and 229 (AC locomotive). ELL's newest locomotive that has been released by Siemens is 193 228. The Vectron AC locomotives sports the logos of Magyar Magánvasút (MMV), a freight operator from Hungary. You may know this company for its colorful orange Softronic machines. [update] On 09.06.2015, ELL handed over the first of three Vectrons to be leased to MMV in Linz (AT). So after 228 two more will come. This leasing contract was signed during the Transport Logistic fair in Munich last May. MMV plans a international expansion of its activities on the short term. Part of this strategy is getting a operation certificate for Slovakia and Austria. For this latter country, the new Vectron locomotive can be used, as 228 is equipped for Germany, Austria and Hungary. RegioJet wants to grow. It wants it ridership increased by 30% during the next years. It will expand both domestic and international services and introduce new night trains (Prague - Ostrava - Košice, as well as Košice - Bratislava). The locomotive fleet will be doubled. Next December two more Vectron locomotives will arrive. It is not clear yet if these machines are leased or purchased. They will be operated on CZ-SK cross border trains: Prague – Ostrava – Zilina and Prague – Vsetin – Zilina. RegioJet wants to take the lead in international traffic between the Czech Republic and Slovakia. As of December 2016, RegioJet will have another eight Vectrons for service expansion the Czech Republic. Also the fleet of passenger coaches will increase soon to approximately 200. RegioJet has just signed a deal with which it acquired seventy second hand coaches from an undisclosed operator, to be completely overhauled. Meanwhile, RegioJet is awaiting the formal approval of its new Astra Vagone coaches (10 units, designation: Bpmz 20-90). Nice detail is the touch screen multimedia system integrated into the back of the head rest of every seat. The official delivery is planned for July. Slovakia's approval body has granted permanent authorization for the Vectron multi-system and AC versions to operate in the country, thus permitting the Vectron to travel on the Slovakian rail network's routes without restriction. LokoTrain form the Czech Republic has started using the new ELL locomotive no.193 221 for its freight services. The other LokoTrain Vectron locomotive, ELL 193 220, was seen in Germany yesterday. It ran from Passau back to Munich. On 16.04.2015, the new ELL 193 221 left the Siemens factory in Munich (REV 10.04.2015) heading south to Linz in Austria. The DE/AT/HU/PL/CZ/SK/RO configurated multi system engine will be the second unit to be hired to LokoTrain for the Czech Republic. Title images: the brand new ELL 193 215, now in service of LTE. 2014-12-26 [DE/AT] Third ELL Vectron for ecco-rail? [DE/AT] Third ELL Vectron for ecco-rail? Austrian operator ecco-rail has published pictures of the new ELL 193 217 in Munich. It will be the third ecco-rail ELL Vectron, next to 193 211 and 212. The multi system Vectron locomotive no. 193 207 now has LTE stickers. It is the second locomotive with this livery. 193 208 looks identical, but this is an Vectron AC locomotive. First run from Kosice to Zilina in Krpelany. On 21.11.2014, RegioJet and Siemens commonly presented locomotive 193 214 at Praha hl. n. (main station). It is the first of three Vectron locomotives RegioJet is hiring for its Bratislava - Košice services in Slovakia. RegioJet is hiring the Vectrons for its services in Slovakia: two are needed for the for daily service, the third one is the spare locomotive. Later on it can cover peak hour trains. RegioJet class 162 locomotives will haul all international services and the ones on CZ. The Vectron will come to Prague occasionally for service, if not done in Bratislava, Slovakia. For now, ELL 193 214 lost its approval for DE/AT/HU temporary because of modifications for CZ and SK. Siemens stated that this is temporary and they'll do the paperwork to certify the complete package DE/AT/HU/CZ/SK again. 193 214 left Praha on 21.11.2014 piloting 162 116 hauling train IC 1011 Praha -Žilina. It came off the train at Hranice na Moravě and ran light engine southwards to Bratislava. Here it was used for staff training over the weekend of 22/23 November. Afterwards it was to be used on RegioJet’s trains IC 1003/1010 between Žilina and Košice until the end of the 2014 timetable in mid-December. 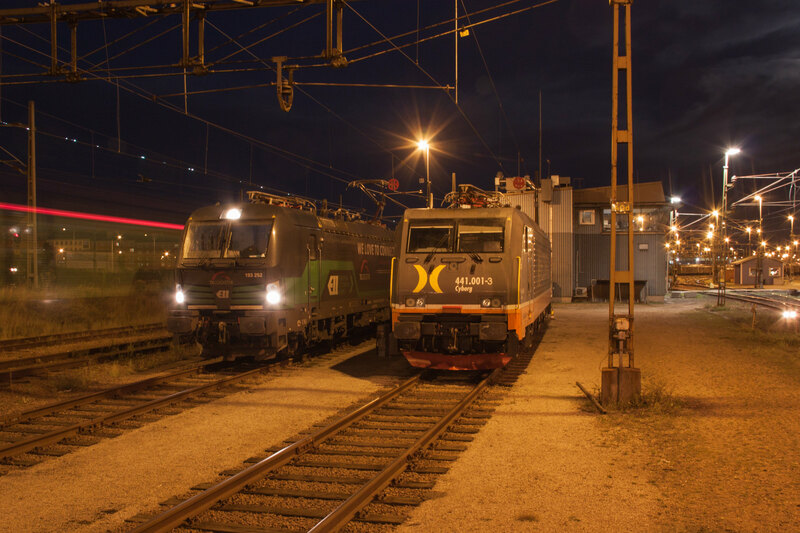 During the past weekend, ELL Vectron 193 214 was used for hauling several RegioJet passenger trains in the Czech Republic. The private passenger operator wants to start regular services with the new Siemens locomotives as soon as possible. Unlike what was expected, they will not be used in Slovakia first, but start in the Czech Republic. The ELL 193s will initially run between Prague and Ostrava. From mid-December they will be used in Slovakia. On 05.11.2014, test runs were made with ELL 193 214 in Slovakia. The first multi system Vectron locomotive for a customer of Siemens. Various media now report on a approval for test operation for Vectron MS locomotives in the Czech Republic. Per 01.07.2014, SETG is hiring ELL locomotive no. 193 831 (white) and RTB Cargo is using 193 832 (ELL livery with RTB Cargo logos). At least three more machines will enter service within weeks. 193 209 and 210 are being prepared for SBB Cargo International. The operator wants to start revenue service with the locomotives on 01.09.2014 on various Hamburg/Bremerhaven – Nürnberg/München/Regensburg relations. Another machine is being prepared for Ecco Rail. This company will get three locos this year. Our first picture of ELL locomotive no. 193 208. This is the first locomotive of ELL that has the complete livery of the leasing company, as presented earlier this year. We almost missed this: the press statement from ELL about the handover of the first new Vectron locomotives. It includes images of a locomotive we did not see before: ELL 193 208. It is the fifth unit now in our ELL locomotive list. Next to that, it is also the first engine in the complete ELL livery like it was presented at the launch of ELL. Poland will soon get its second Vectron MS locomotive. On 24.07.2014, locomotive no. 193 823 ran from Munich to Frankfurt a/d Oder. The locomotive will be used for ETCS tests between Psary and Góra Włodowska (CMK high speed line). Since 13.09.2013, Vectron MS locomotive no.193 820 is already in Poland for tests and homologation. BTW: 193 811 was the third Vectron that had a test run today in Munich. This one is for Railpool. The multisystem version of the Vectron locomotive received authorization from Germany’s Federal Railway Authority (EBA) in June. Vectron MS is equipped for operation under line voltages of 15 and 25 kV AC and 1.5 and 3 kV DC. It has a nominal rating of up to 6400 kW and is built for a top speed of 200 km/h. The authorization process also included the approval of additional functions such as an electric brake effort of up to 240 kN, multiple unit operation via ZMS multitraction control and ZDS double traction control, and double-heading with other Vectrons as well as with classes 120, 152, 182 (ES64U2) and 189 (ES64F4). For an AC or multi-system locomotive, other customer-specific versions can be certified through a delta review based on the first prototype that has now been granted authorization. The transfer of Vectron MS authorization to neighboring countries like Austria is in full sway. 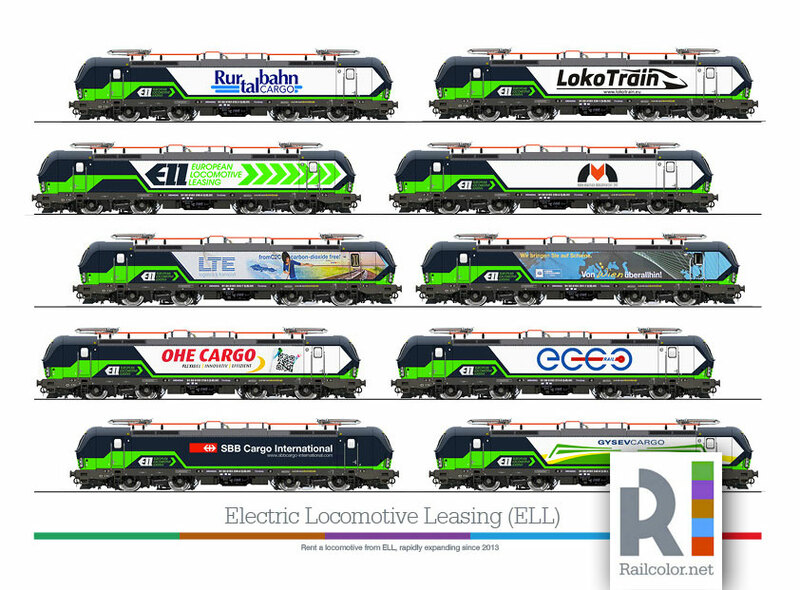 We just could not resist.... A real Vectron locomotive in the livery of European Locomotive Leasing. At least in the livery as published yesterday, that proves to be a quick sketch. We had to finetune it a bit, as the ELL proposal is a bit buggy, especially around the headlights. The big question is, will a real locomotive ever get this paint scheme? We know more examples of preliminary design proposal of leasing companies, just for promotion. The end result was always, uhm more 'practical'. Railpool once started with a dynamic swooshy visual in grey and blue: Silver. CBRail went from blue and gray to orange, ending up with plain light grey painted locomotives. Dull and get dirty easily. Of course, the final color schemes are more practical, and give plenty of space to the various lessor to pimp their locomotive. But this rarely happens. Will ELL take this opportunity to come with something different? European Locomotive Leasing (ELL), a provider of full‐service locomotive leasing solutions to freight and passenger operators throughout continental Europe, and Siemens announced signing a framework contract for the order of as many as 50 state‐of‐the‐art Siemens Vectron locomotives. The first locomotives are bindingly ordered and will be delivered immediately. The additional locomotives will be delivered from 2014 through 2016 and allow ELL to satisfy the demand from its expanding customer base. The order is for AC locomotives and for multi-system locomotives. The AC units are intended for border-crossing traffic in Austria, Germany and Hungary. The multi-system units can be deployed in border-crossing traffic not only in Austria, Germany and Hungary, but also in Poland, the Czech Republic and the Slovak Republic. In addition to the national train control systems, each locomotive is equipped with ETCS. The locomotive comes with a maximum output rating of 6400 kW and is built for a top speed of 160 km/h. It is already wired to accommodate other train control systems. The locomotive leasing sector in Europe benefits from highly attractive market dynamics that ELL is well placed to capitalize on. These include rail traffic liberalization and promotion across the continent, the growing prominence of private rail operators more likely to favor leasing rather than owning locomotives, and an improving macroeconomic outlook.